Civic freedoms, including the rights to freedom of association, peaceful assembly, and expression are respected and generally upheld in France. Freedom of association is widely respected in France. Freedom of association is widely respected in France. Formal and informal associations, NGOs and trade unions are free to operate independently and without state interference. Freedom of peaceful assembly is also generally observed in France. Freedom of peaceful assembly is also generally observed in France. However, in the wake of terrorist attacks in Paris in November 2015, a state of emergency was imposed, which included a temporary ban on demonstrations. 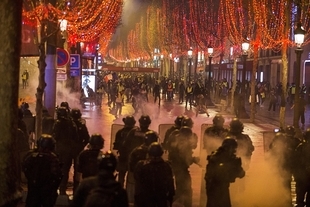 As the government attempted to extend the initial three-month state of emergency, thousands of protestors took to the streets in Paris in March 2016 to protest against the perceived misuse of the emergency powers. In May 2016, approximately twelve members of two far-left organisations, Action Antifasciste (AFA) and Mouvement Interluttes indépendant (Mili), were formally banned from accessing parts of Paris where a demonstration against a labour reform bill was planned. Freedom of expression is also broadly respected in France, and a diverse media landscape flourishes. Freedom of expression is also broadly respected in France, and a diverse media landscape flourishes. However, the terrorist attacks of 2015-16, including the January 2015 attack on the Paris offices of Charlie Hebdo has resulted in some worrying restrictions on press freedom. Following the Charlie Hebdo attacks, more than 250 people were charged with condoning or provoking terrorism, with some receiving prison sentences after accelerated court proceedings. Human rights groups have voiced concern that the prosecutions may have involved speech that did not incite violence. In October 2015, a French court confirmed the convictions of 14 individuals for incitement to racial discrimination on the basis of an 1881 law on freedom of the press. They had previously participated in non-violent initiatives in a supermarket calling for the boycott of Israeli products.